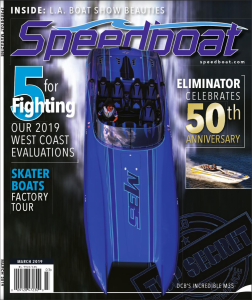 As seen in Speedboat Magazine’s March 2019 Issue. I just picked up an HTM SR24 with a 8-71 blown 489, a Max Machine Works Bravo One drive, and 30 pitch Bravo One four-blade propeller. I’ve had it out once, loaded with eight people, and it took forever to get on plane. Would an aerator help with getting the boat on plane with this application?Do you guys have plans to design one for Bravos/XRs? How about adding a tunnel tab? Any help would be appreciated. First of all, you cannot do a valid evaluation of your HTM or any smaller single-engine catamaran with eight people onboard. In order to ﬁgure out the setup on the boat, I would start with two people that weigh about the same amount and with the fuel tanks about one-half full. Generally speaking, it will take a little time to get the boat on plane. Being that your boat has a supercharged motor, I doubt that the problem is being caused by the prop not spinning up. On the other hand, I think it is slipping quite a bit as it comes over on plane. Adding an aerator would make the problem worse causing the propeller to cavitate even more. Aerators are effective on surface drive applications. We manufacture them for Mercury Racing IV and V-drives. We also manufacture them for SSM Six (now M-6) and M-8 drives. We also make custom aerators for shaft drive applications. Surface drive applications are designed so that approximately one-half or less of the propeller is in contact with the clean water while underway at higher speeds. Because most performance marine applications only have one speed, when the propeller is buried when not on plane, the aerator creates propeller slip while the boat is coming on plane to allow the engine RPM to increase into the power band. When operating a boat with aerators, the propellers slip when coming on plane, and after it is on plane the propellers “hook up” and stop slipping. It almost feels like there is a two speed transmission. Once the boat is on plane, the aerators are no longer effective. This is true except in rough water conditions especially associated with offshore racing where the aerator helps get the engine RPM back into the power band when landing hard after launching off a wave. The HTM hull has a unique bottom with somewhat of a vee between the spon-sons, instead of a ﬂ at tunnel or a center pod. Typically, an HTM seems to bow steer a little until it gets up to about 60 or 70 mph. After that, it starts to pack air and acts more like a traditional catama-ran. If you had eight people onboard, it is unlikely that you would experience the true handling characteristics of the boat. The HTMs are surprisingly good at higher speeds, especially for a 24-footer. I have actually driven one during a test in a con-trolled environment well above 140 mph. Tunnel tabs are used on twin engine catamarans. I don’t know how you would add one to your boat. Trim tabs or K-planes might be an option but I would probably not do that either, unless you want to try to use the boat for wake-boarding or some-thing else that it is really not designed for. Instead, you might consider having two propellers. 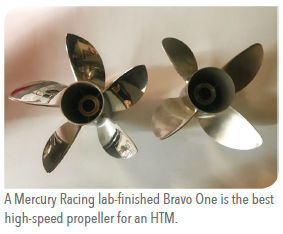 I think that a Mercury Racing Lab Finished Bravo One is the best high speed propeller for an HTM. I have tried many other propellers on these boats and none are as forgiving, handling wise, as the 4-blade. Stock Bravo One propellers will get on plane a little better and have a little better mid-range efﬁciency. The Mercury Racing Lab Finished Propeller will give you the best top end speed. As a second propeller choice, especially if you intend to take eight people with you every time you go out, I would select a Mercury Racing Max-5 in a 29 pitch. The time to reach plane will improve and the mid-range efﬁciency will be signiﬁcantly better. Pickups are available that mount on the transom as well as through the bot­tom. On a single engine application with a right-hand rotation propeller, it is best to mount the pickup on the port side of the keel or in the port sponson, because with all things being equal, the port side of the boat runs slightly deeper in the water because of the propeller torque. Through­ hull dumps will need to be added for the intercooler water going overboard. I do not recommend stealing water from the engine cooling water. I have seen installations where a sea strainer has an outlet to feed the intercooler. This is not a good idea because the sea pump can draw air backwards through the intercooler and cause water starvation and an overheat condition at idle. Even if a check valve is in the system, this is risky because a small piece of debris can compromise the check valve, causing it not to seal, which will result in air being drawn back to the sea pump-causing possible overheating and damage to the pump and impeller. I’ve heard varying opinions on this, but I ﬁgured I’d go straight to the professional. Is it best for outdrives/props to spin inwards or outwards on twin engine applications and why? What are the differences? This is a subject that we could spend a whole day discussing because there are so many variables. So, my answer is going to be based on general assumptions. First of all, one of the factors that inﬂuence the desired rotation is the propeller shaft height in relation to the bottom running surface. Other factors include the bottom design and on vee bottoms, whether or not the engine installation is side-by-side or staggered. On catamarans, in addition to propeller shaft height compared to the last running surface of the bottom, another factor that inﬂuences the effect of the propeller rotation is how close to the tunnel the drives are located. If the propeller rotation is “seeing” some clean water coming from inside the sponsons, it will modify the inﬂuence of the propeller rotation. Then, you also have to consider propeller design, propeller diameter, and propeller blade rake. Generally speaking, cleaver style propellers create stern lift and round ear propellers help to lift the bow. Surfacing propellers have less leverage inﬂuence on boat attitude compared to propellers that are running deeper. Assuming that vee hulls and catamaran sponsons have bottoms that are on an angle (deadrise), this is what creates the propeller rotation inﬂuence. It is the “clean” water that is hitting the propeller blades that inﬂuences hull attitude. If the propeller is rotating out, the downsweep of the propeller blades “sees” more clean water that the upsweep. This causes stern lift. On the other hand, when the propeller is rotating inward (starboard: left, port: right), the upsweep of the blades “see” more clean water which pulls the stern down and results in bow lift. Are you confused yet? Let me provide some common scenarios. With conventional (non-stepped) vee bottoms, most were originally built with the drives running pretty deep with the propellers turning out. Most of these boats are side-by-side installations with the drives about 36 inches apart. This conﬁguration helps the boat to get on plane by lifting the stern and results in predict-able maneuvering around the docks. A typical boat with this application would be like a Baja Outlaw, an older Formula or Scarab. In some cases, changing the propeller rotation on these boats results in better top-end performance, especially if shorter drives are also installed. Stepped bottom vee hulls traditionally have the drives installed higher and the boats are designed to run with a ﬂatter attitude. Included would be boats built by Fountain (later models), Outerlimits, Nordic, Nor-Tech, Formula FasTech, some Cigarette models, to mention a few. Most of the hulls work better and are faster with the propellers turning in for optimum performance and handling. This is partially because the propellers are lifting the entire hull and the aerated bottoms are reducing the wetted surface. Catamarans are a whole different set of circumstances. But the fact remains that in most cases, propellers spinning in will create bow lift and propellers spinning out will create stern lift. Propeller rotation can also inﬂuence turning attitude. For example, most SuperCat race boats turn the propellers outward for maximum top speed and better turning in racing conditions. Catamarans without center pods such as Skater, MTI, Mystic, and others work well with either rotation depending on the intended use and depending on the propeller blade rake. 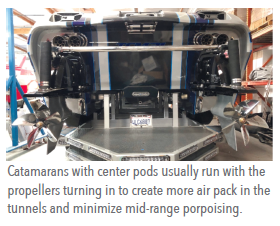 Catamarans with center pods usually run with the propellers turning in to create more air pack in the tunnels and minimize mid-range porpoising. So, what is rake? Propeller blade rake is essentially the angle that the blades are swept back in relation to the propeller hub. Most “Bravo” style propellers are only available in the rake associated with the particular propeller model. Racing cleaver propellers are available in standard rakes from 15 to 21 degrees. In general, the higher the rake, the more lift a propeller creates. If the propellers are turning in, it will be bow lift, and if they are turning out, it will be stern lift. 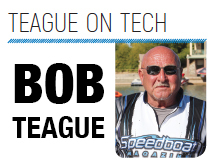 For your chance to be featured in Teague On Tech, email your questions for Bob Teague to Ray@speedboat.com. This entry was posted in Teague Blog, Teague On Tech by Teague Custom Marine. Bookmark the permalink.